All have a one-piece shell with a definite apex, or high point, though the shell shape can be very pointed or relatively flat. The Rough Keyhole Limpet (Diodora aspera) pictured below is centered in the photo, and is hanging upside down on the underside of a rock overhang. 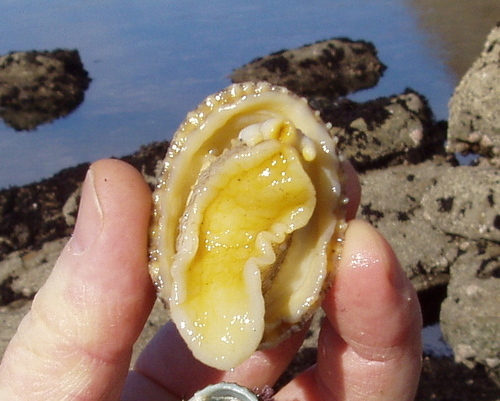 The yellow rubbery material is the limpet's foot, which is only visible when the limpet is moving. 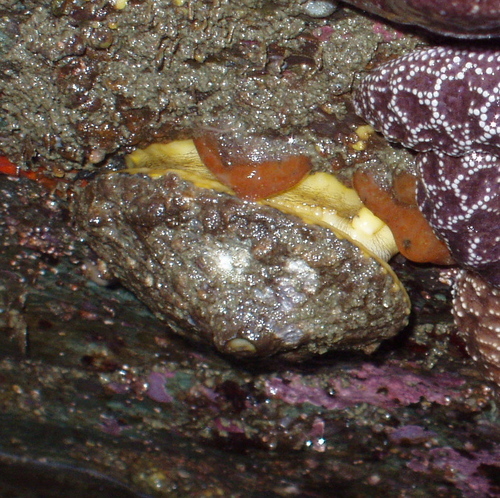 The red-orange substance is NOT part of the Limpet. When the tide recedes, a limpet grinds its shell into the rock to make a complete seal, trapping water under its muscular foot. Over time, the limpet scrapes out a depression that exactly fits the shape of its shell, and this is called a "home scar". The water trapped in the home scar acts as an indivdual "tide-pool", preventing the animal from drying out during low tides. Limpets are often found in crevices on rock faces or under overhangs, where they find some protection from the pounding surf. The Ribbed Limpets (Lottia digatalis) pictured below are found in the splash zone and high tide zone (areas first uncovered when tide recedes). All Limpets feed at night by scraping algae off rocks with a radula, a file-like rasping "tongue" located in their mouths. Limpets travel 6"-36" every night, leaving a mucus trail to find their way back to their home scar. There is a theory the mucus also fertilizes the algae the Limpet eats, so the limpet is actually a grazer-farmer. I have not seen data to confirm this, but I really love this theory and want it to be true!